CAPSICUM AND PICKLED LIME(SRI LANKAN). A SPICY, SOUR SIDE-DISH FOR YOUR MEALS. A PLATE OF RICE AND CURRY TASTES BETTER WITH THIS RICE PULLER. GLUTEN-FREE, VEGAN, VEGETARIAN, LOW-CARB. Deseed the Capsicum and cut lengthwise, set aside(please be mindful of the seeds as they tend to burn your hands). Place pan over medium heat, pour in oil, leave it to heat for a few seconds, add curry leaves, onions, tomatoes and sauté the ingredients for 2 minutes. Once they are sautéed, add Turmeric and the capsicums, increase heat to medium, add a pinch of salt and chilli flecks and continue to sauté the ingredients in the pan, pour in 1/4 of water and maldive fish(optional) and cook until the capsicums are soft and the water has evaporated. Once all ingredients in the pan are cooked, remove the pan from fire and add the pickled lime. You might need just one whole lime or more depending on your taste, add half of the pickle and make sure it doesn’t overwhelm the curry then gradually add more. 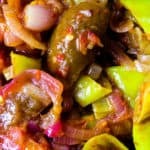 The reason you need to turn the stove off when you add the lime is if you add the pickle and let it cook, the curry becomes bitter, believe me, this is experience writing, turn the stove off before adding the pickle. Gently mix the lime pickle into the Capsicum curry and give it a taste before serving.